April 23 is the day of Saint George all over Crete and Greece. Somewhere up on the mountains of Crete there is Saint George the "Galatas" or the "Milkman", as it is translated in Greek. This particular Saint George is in the village of Asi-Gonia in Rethymnon district. Asi-Gonia is a mountainous village with 800 inhabitants, most of them being shepherds. The village is mentioned in the Roman period as a village controlled by the town of Lappa, the Argiroupolis of today. It is also mentioned in the Venetian period and it is believed that the initial settlement was built on a more easterly location than today. No Turks lived in Asi-Gonia during the Turkish occupation period. The reason is that the people of Asi-Gonia were able to control easily the gorge, which is the only natural passage to their area. It is the same gorge that you will drive through to reach Asi-Gonia today too. The people of Asi-Gonia took part in all liberation fights against the Turks and the 1867 revolution was declared here. George Psychountakis is a local hero and the author of the "Cretan Runner". He was born and raised here and he was a shepherd like the rest of his family. Psychountakis was a messenger for the Greek and British resistance during the German occupation period in World War II. His memories from those days are the subject of his book "Cretan Runner", translated to English by Patrick Lee Fermor. Psychountakis has also translated Homer's "Iliad" and "Odyssey" from ancient Greek to the Cretan dialect. For his work as a writer he was awarded by the Academy of Athens and the Polytechnic School of Crete. 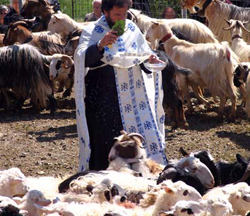 In Asi-Gonia there is the unique tradition of the blessing of the sheep on April 23, the day of Saint George. The shepherds of the area believe that Saint George protects them and their flocks and on April 23 they bring their sheep to his church, they milk them and offer the milk to everybody present. 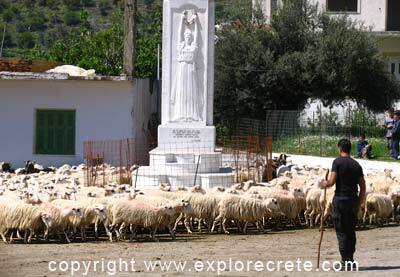 The church is very close to the village's square and the spectacle of hundreds of sheep surrounding the statues of the local heroes, while they are waiting their turn to be milked, is unique. The shepherds hang their best sounding bells ("leria") on their animals, the sheep gather in the "kourta" outside of the church and they are milked one-by-one, the flock is blessed by the priest, and the milk is offered to everybody present in plastic bottles. 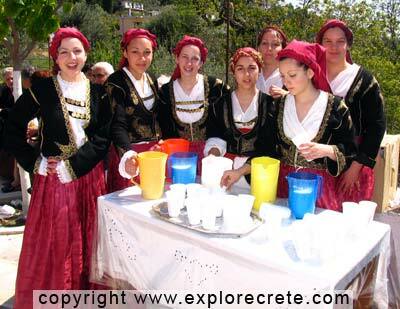 Part of the milk is boiled and offered in glasses to the visitors by girls of Asi-Gonia in traditional dresses. This tradition is very old and nobody can say when it started. The people of Asi-Gonia claim that it goes back in time until the very first days of the existence of their village. The shepherds of the area own 25,000 - 30,000 sheep and goats and it is unthinkable for them to skip the traditional milking even for a single year. Those shepherds, who keep their animals a great distance from Asi-Gonia and cannot transfer their sheep to the church, will milk them and take the milk to the church instead. The feast lasts the whole day from early in the morning until late in the afternoon, when the last flock of sheep will be milked and blessed. A lot of people, mostly locals and some tourists, visit Asi-Gonia this day and the cafes in the village's square are full all day. The air smells of grilled souvlaki, the traditional Greek dish of skewered pork meat. On April 23 it is the nameday of George. The Greek names are Yorgos for men and Yeoryia for women. The Yorgos and Yeoryia of Asi-Gonia will be visited by friends and family in their houses in the evening and the celebration will last until late in the night. If April 23rd lands during Great Lent or Holy Week, then the feast is transferred to the Monday after Easter.